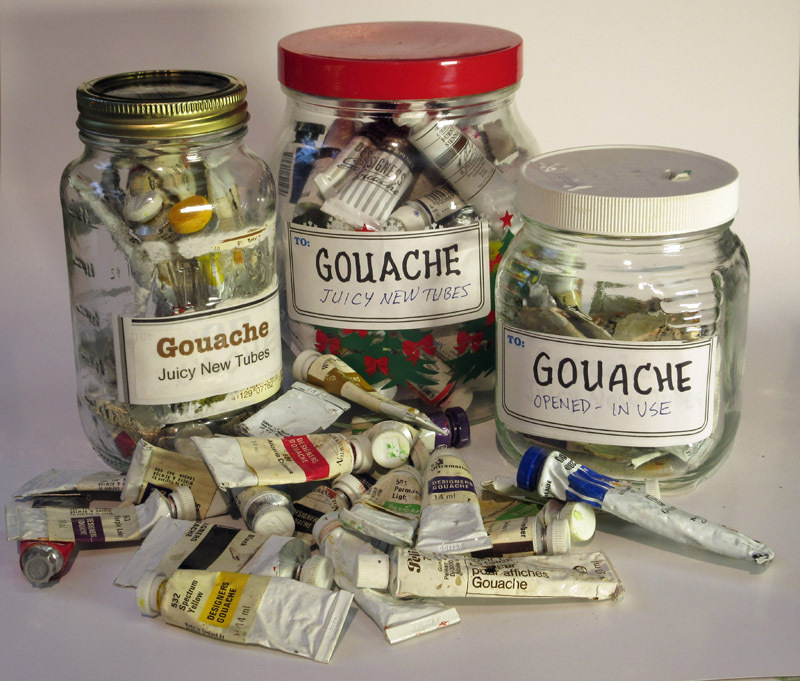 Tip: Tubes of gouache stay fresh if you keep them sealed in big glass jars. When you're in the field and you don't want to take glass, you can use those resealable faux-Tupperware containers , which are unbreakable, airtight, and they protect the paints from being crushed in your kit. Great tip. I store my gouache tubes in plastic zipper bags in my backpack usually. How you made such stickers? HNK, I use sealable plastic food containers, what we call Tupperware here in the USA, when I bring my gouache in the field. For the stickers I write on mailing labels with a marker or print on them. Like HNK, I use zippper seal plastic bags, with as much air squeezed out as possible. I'd think that would be an even better way to keep the paint from drying in the tubes (though perhaps not as easy to store/organize on a shelf). Or am I missing something? NIce. I just put my tubes in an empty spaghetti sauce jar yesterday. Really enjoying my Gouache in the Wild DVD James. I went to my local fishing store and bought a small Plano plastic box for my paints ($13 I think it was). Plano and others sell many sizes in waterproof/airtight configurations. They are almost indestructible and I've not had one open accidentally. That box stays in the studio unless I know I'll have time to use them, then they get tossed into the kit with my watercolor setup that goes along almost everywhere. I use a limited palette so I'm able to fit all my gouache and casein tubes in that one box. That reminds me to tell you I really enjoy your posts on limited palettes. I'm thinking of picking up tubes of Primary Yellow, Primary Magenta and Primary Cyan (with white of course and maybe a black) just to see if it does produce a broader range. Have you ever tried that palette? Lou, thanks for the tip on that airtight box. I have another video that I haven't released yet where I paint a sort of grayish cityscape with bright cyan, magenta, and yellow gouache pigments. It's a lot of fun. Jim, if spaghetti sauce jars aren't big enough, what we did was to ask at our local diner if they had any extra giant mayonnaise jars, and they did! They were glad to give those to us. I use them for casein tubes, which are bigger than gouache. Tom, yes, the ziplock bags are great--only problem is that they don't provide any crush resistance when carrying tubes on location. That's why I use the faux-Tupperware containers made by Ziplok and other companies (which I'll link at the end of the post). They're unbreakable, airtight, and they protect the paints from crushing. Has anyone found that also keeping their watercolor tubes in a sealed container helps keep them from drying out too much? I haven't thought to do this yet, but after reading this post, I think I will. Never occurred to me that the paints might dry out in the tubes. 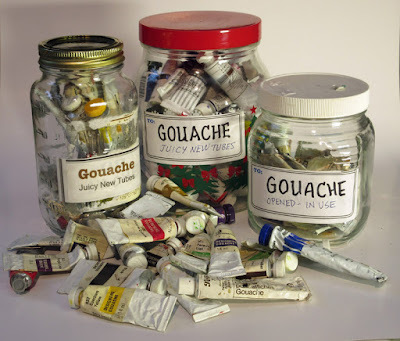 I store most of my paints in plastic boxes (not air tight)… I suppose plastic jars, like the large mayonnaise jars would work as well as glass. I use a fishing tackle box from Flambeau Outdoors, it comes with removable dividers so It is easy to compartmentalize my tubes of gouache, a set of brushes, a ruling pen, plus a few odds and ends all in one box. There are various sizes to choose from. If anyone is interested in belt packs similar to James' the fishing/tackle industry has quite a range available in a variety of configurations.